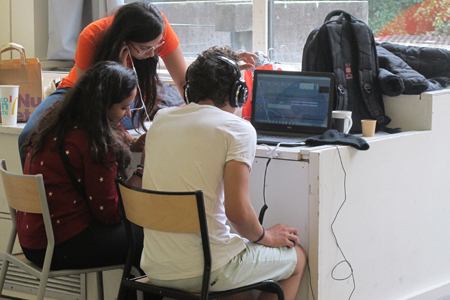 In continuity with the Winterschools, this was the first edition of a Summerschool: an intensive week of courses and workshop about the sonic urban environment. 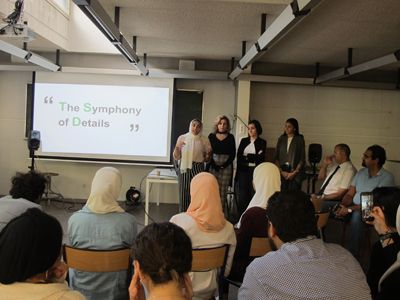 It was organized by Noha Gamal Saïd in collaboration with Ain Shams University (Cairo) and welcomed 26 students of landscape design department. 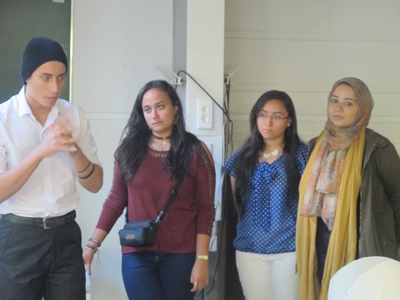 For the first time all the courses and workshops were in english with sometimes translations in arabic. with two fields of study: Vigny-Musset & Caserne de Bonne. Dense urban form proposes a specific architectural language in which aspects such as building heights, shared spaces or more generally the question of interfaces on building façades play an important role in constituting ordinary listening and changing sound practices. Providing a dynamic relation to the surrounding, varying from ground to sky, from near to far or from intimacy to exposure, the dense habitat brings out remarkable listening situations: bird-eye listening, immersion, enclosure, panoramic soundscape, double listening, acoustic exposure or recess. What potentials can this density offer to residents and inhabitants in terms of sonic qualities? In this summer school, we will work on the pairing space-sound focusing in the so-called eco-districts as a type of habitat seeking sustainability. We have chosen two districts in Grenoble: Vigny-Musset, Caserne de Bonne and the Three Towers de l’Ile Verte. In this context, we are particularly interested in two archetypal dense urban forms: towers and courtyards, defining protrusions and hollows. The interfaces located at the articulation between private and public spaces, such as balconies, loggias, corridors and landings, form shared sound spaces. They are as much configured by the sound qualities of the street as they themselves configure the sound qualities of the latter. It is in this reciprocal exchange that we shall consider these liminal spaces, in the way that they redraw new acoustic arenas and negotiate their intimacy with public spaces. 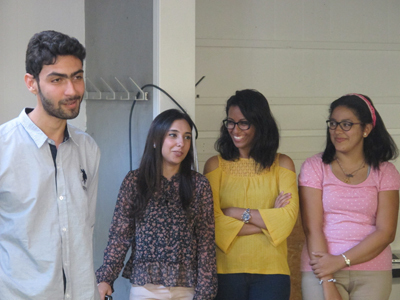 The approach proposed to the participants will be elaborated by a set of methods, both qualitative and quantitative. After the experience in situ which helps distinguishing the different sonic characteristics of the site, participants are invited to manipulate sound dimension by means of various methods developed at Cresson-AAU: sound recordings, interviews, parametric sound modeling… At the end of the workshop, it is required to elaborate a soundtrack reflecting the way each group of participants perceives, conceives or projects the sonic ambiance of the space. This lecture will be an introduction of the domain of urban ambiances and will focus more specifically to its sonic dimension. Although the aesthetics of everyday life implies the whole human sensorium and makes it difficult to artificially separate the senses from eachother, we will explore what can be learned about an ambiance when we just listen to it. In other words, how and under which conditions is it possible to developp a sonic paradigm of urban ambiances? The basic argument is to consider sound as a particularly efficient medium to investigate and give an account of urban ambiances. Various ideas will be explored in order to answer this question, involving theoretical, epistemological and methodological arguments. Three main directions are pointed out: the first one relates to the tuning into an ambiance, the second relates to the unfolding of an ambiance, and the third relates to the situating within an ambiance. Pascal Amphoux,is an architect, geographer, professor at l’ENSANantes, researcher at Cresson (ENSAGrenoble) and director of Contrepoint Projets urbains (Lausanne), member of the scientific council Europan Europe, of the FMAC (Fonds Municipal d’Art Contemporain, Genève) commission and expert with other diverse Swiss and French institutions. What is a sonic space ? This question is a challenge in our culture dominated by the picture, and even more in the architectural and urbanistic thought. The characteristics of the sonic space are different or the opposite to those of the space as we usually understand it. Sonic space is, first of all, time; it is also discrete, disseminated and without clear limits; it is influencial, reluctant to distanciation. It invites finally to mix the disciplines and to face the sensitive and creative experience. To apprehend those characteristics will be the purpose of the notion of sonic effects. Jean-François Augoyard, is a philosopher, a town planner and a musicologist. Honorary research director at CNRS (NATIONAL CENTER FOR SCIENTIFIC RESEARCH). 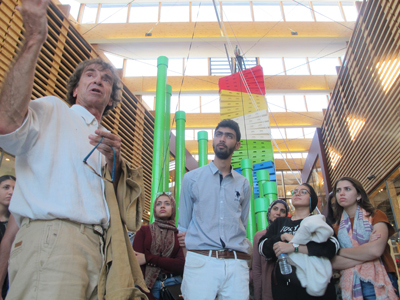 Founder of the Research center on the sound Space (Cresson) in 1980, he was a co-founder, in 1992, of the laboratory of architectural and urban Atmospheres (CNRS-MCC) and of a doctoral formation on the same theme. His first works concerned the manners to walk, the manners to live, and the social behaviours in town. He then developed interdisciplinary notions and methods of analysis in situ of the sensitive, in particular sound environment. Finally, he led several researches on the ordinary esthetic perception and on the urban artistic actions for the Ministry of Culture. He works now on a theory of the architectural and urban atmospheres. Two fundamental notions were invented during the last century: the sound object (Pierre Schaeffer) and the soundscape (R.Murray Schafer). Precious in pedagogy or for the very fine analysis of a precise sound phenomenon, the first is of a too heavy use at the scale of an architectural or urban complex. The second, also fundamental to reveal the compositional and landscaped dimensions of the sound, leans on an attractive but too discriminatory esthetics for a trivial approach of the daily situations. Between these two approaches was needed a tool allowing to work on the intermediate level, the level of concrete configurations between three components of any sound situation: acoustic sources, constructed space and sound perception. Soundscapes : unthought of « sustainable projects » ? 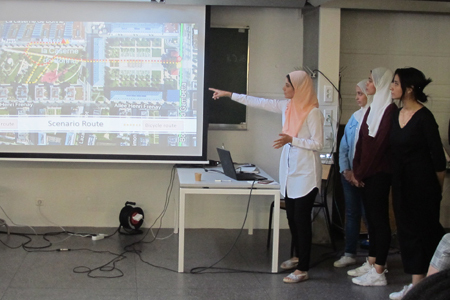 This presentation will introduce the results of an empirical research carried out in several «sustainable neighborhoods» of northern Europe WGT – Amsterdam ; BO01 and Augustenborg – Malmö; Kronsberg – Hanover) – (Manola 2012; Faburel, Manola and Geisler, 2011). 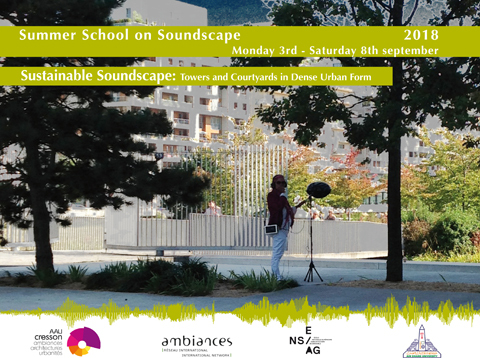 Based on an “updated” definition of soundscape, proposed through the evolution of the landscape theory in France, we will present soundscapes of the inhabitants of these neighborhoods but also those projected (or not) by the carriers of the projects. What roles does the sonic-aesthetic experience play in urban sustainable spaces? Does sound (and other sensory relations) participate at the perception, recognition and feeling of the urban sustainability? 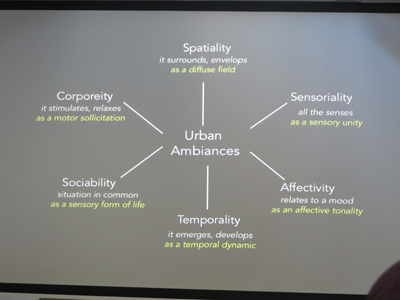 Is sound and other senses an opportunity to create the contemporary city landscapes or an unthought “approach” of urban sustainability et moreover urban contemporary design ? Théa Manola is an architect, urban planer and phD in urban studies. Teacher atl ENSAG, researcher at CRESSON, associated to the Research Workshop Politopie and to UMR LADYSS. She works on the (multisensory) landscape, the ordinary esthetics and the contemporary sociopolitical transitions, in particular in link to the environment. This presentation tackles the research project: “Esquis’sons! 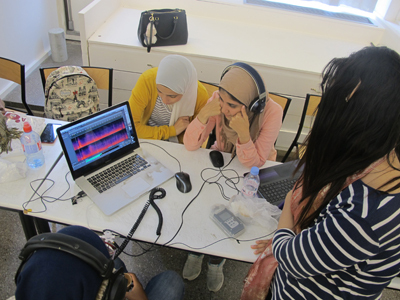 Assistance tool to design sustainable sound environments”. This project studies, in 6 eco-districts in Europe (Germany, Spain, France and Sweden), the sound qualities of intermediate spaces located on the building facades such as balconies, loggias, terraces and circulations (BLTC). A cross analysis of the physical form, the sound environment and the users’ practices has allowed to point out the minimal conditions of existence of multiple remarkable sound situations. 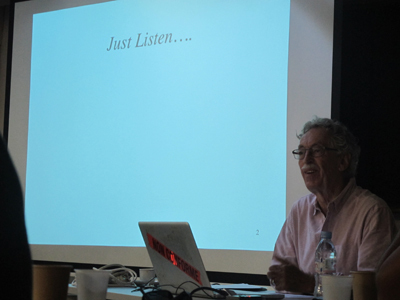 Seventy-two remarkable listening situations have been identified and compiled in a comprehensive catalogue. This catalogue constitutes an important tool that can help architects integrate the sonic dimension in conceiving intermediate spaces on building façades. 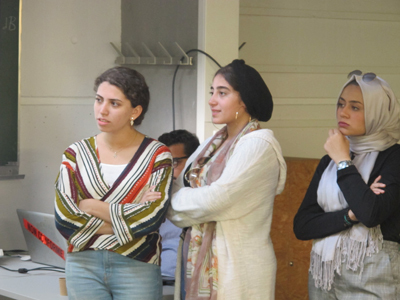 Noha Gamal Said is a doctor in architecture and urban design, assistant professor at the Ain Shams University, Department of Architecture and urban Design – Cairo, associate researcher at Cresson research center. She is interested in the sound dimension of cities in a multisensory approach. Her researches tackle the contemporary dimensions such as sustainability, densification of cities seen from the angle of the daily sensory experience. She participates in several research projects: building interfaces: Esquis’Son! (Http://www.esquissons.fr/); the sound configurations of Oasian urbanism: Zerka (http://zerka.hypotheses.org/). Her researches focus also on the issue of memory and the sonic heritage of cities. She was a member of the European sound heritage research team (http://europeanacousticheritage.eu). 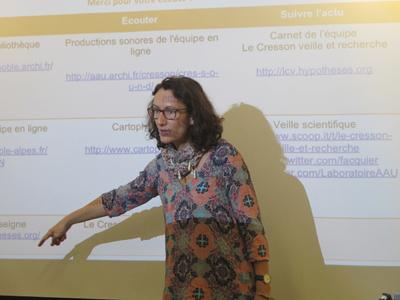 She co-founded the Cresson Winter School together with Nicolas Rémy. This introduction to the architectural acoustics will present the various stakes and the tools which mobilizes the sound in the space: how to comprehend it, how to measure it, how to modulate it ? 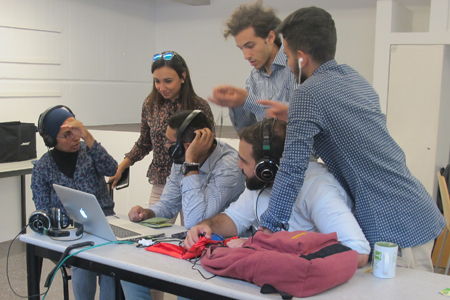 By presenting various rules and various examples, and also by thinking together about the modalities of the sound (its various physical and sensitive forms), the purpose will be to establish a basic knowledge for the participants, about sound in the space, its propagation and inflections. This presentation will be based on simple and practical notions of acoustics, related to the notion of sonic effects, developed in Cresson, which enriches the the study of situated acoustic with psychosociological and cultural considerations. 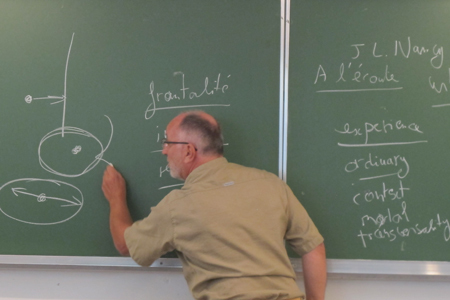 Théo Marchal is a PHD student at CRESSON. 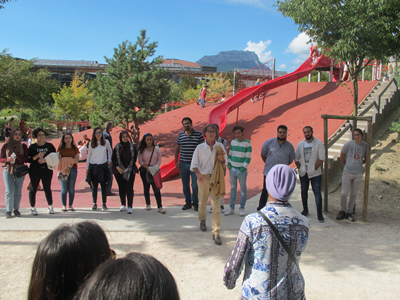 Architect and assistant professor at ENSA Grenoble in the framework of various courses such as the architecture project, theoretical lessons associated with the project and supervision of tutorials, workshops and intensive courses about digital tools and mastery of the ambiances. Esquis’sons! 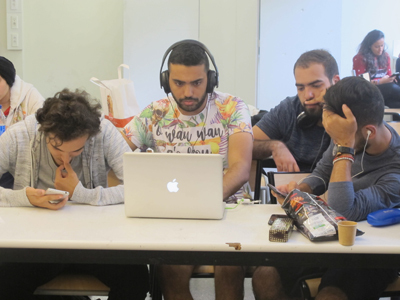 is about « sketching sound » and more specifically « sketching space with sound ». 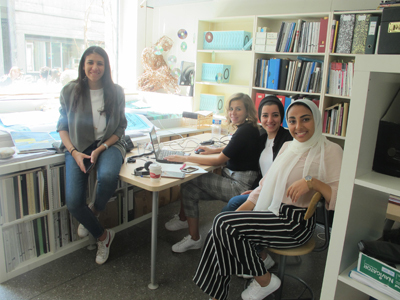 It is an application that generate sound accordingly to a virtual built environment and to listen to the urban and architectural choices that will be made through design process. The sound dimension, which is often little used in the architecture project, makes it possible to support decision making from a qualitative perspective directly during the design phase. « the sound is in the place » – It could be called a tool as it’s a digital « device » manipulable on a computer, but it’s more like a method for the designer who could then change the way he will drive his project. Indeed the form and the eyes are not anymore the only tangible motives. With Esquis’sons!, you can hear a « sonic sketch » in real time ; as you draw. « Sound finalities » We oriented our work on the concept of sketch which allows possibilities of non-determination, as much in the project composition as in its purpose. In this way, Esquis’sons! could be use in the early stages of design and sound could – in a certain way – drive the project. « from the body to the city » – It is also a multi-scale tool where architectural features, whole buildings and even urban shapes are taken into account and could change what you are listening. « Digital ambient design » – Somehow, Esquis’sons! Is a reinvention and a refresh of some CRESSON methodologies about building with sound and ambiances and it try to give leads on potential updates for ambient design. 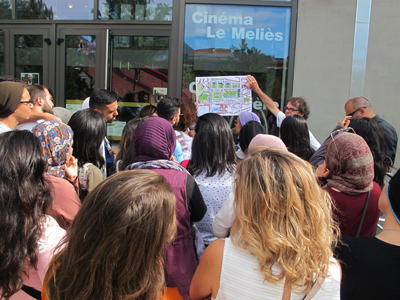 Part story based on personal experience showing similarities and differences between the soundscape of Cairo and Grenoble. The last scene: was in a social gathering but in different locations in the two cities where in Grenoble we recorded in front of a school waiting for kids to walk out so the parents were speaking to each other about their daily life while in Cairo we recorded in a local cafe where also people would talk about their daily life as a sort of a relief thus completing the story of the collision of soundscapes. 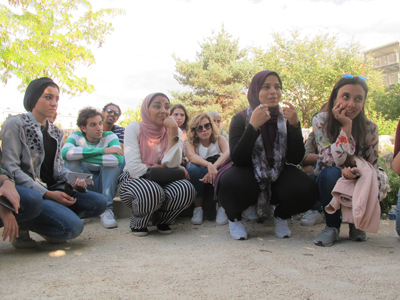 The main idea was based on personal experience of some students from Egypt who stayed in Grenoble for 1 week and felt the experience by themselves. Un jour, il y avait une femme egyptienne qui retourne chaque jour à sa maison après son travail de la même chemin, mais ce jour là, quand elle a vu un jardin, elle est entrée pour se balader un peu. Elle a vu une chute d’eau, elle est allée pour la voir. Cependant,elle vient de se rappeller de sa vie en Egypte et elle a commencé à bourdonner la chanson de l’ancienne chanteuse “Om Kalthoum” qui s’appelle “Alf lila we lila”. Tout a coup, elle réveilla de sa nostalgie à cause de l’aboiement d’un chien à coté d’elle qui joue avec son amie. Puis, elle a continué son chemin pour aller à la maison et elle a retourné à sa vie. This composition introduces a symphony of all the unique details that make up the joyful spirit of this space. The journey captures the unique essence of the space by allowing the user to experience all the various details throughout. This spatial experience is rich in character and takes you through the busy sounds of the streets, to the upbeat noises of different age groups, and the sounds of nature and a lively neighborhood all while experiencing the distinct sounds of various materials. Dynamic sonic experiences of two different types of soft transportations: cycling & jogging. We found that cycling & jogging are the most used activities in la casern de bonne.so we wanted to record both scenarios in almost the same pathways. But we found out that different places & different velocities changed in the ambiences. The change in experiences & description is according to the change in rhythm of movement while the velocity of movement changes the sonic transition. Parts together create a whole. Collages, little memories, merged together implement the experience within seconds throughout highs and lows, exterior against interior, soft and harsh, silent or loud, surfing through our imagination.